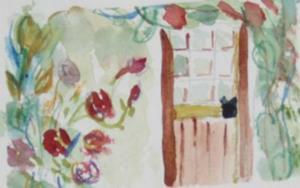 At the Cottage Door is an ACEO trading card. 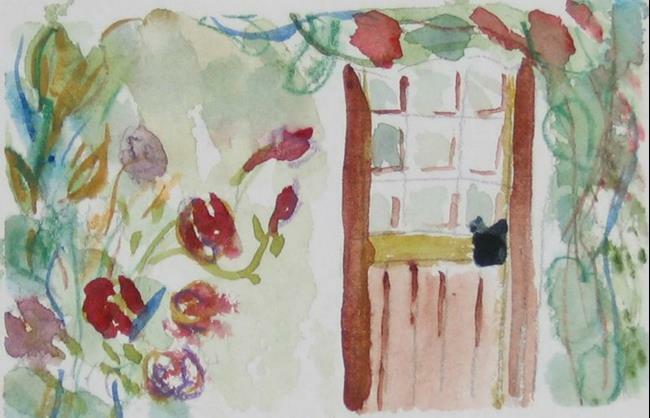 The small cottage is a bloom with flowers. About ACEO Cards: ACEO stands for "Art Cards, Editions and Originals". These cards have one main rule - they are 3.5 inches by 2.5 inches - the size of a trading card. The reason for this is that Art Cards are made to be traded! Art cards are normally available at low prices so that they're available to anyone. Artists from all over the world are creating, and now selling these highly collectable art cards in many different mediums. Watercolor, Oil, Acrylic, Colored Pencil, Pastels, Petrography, Pen and Ink, Sketching, Collage - the sky is the limit. Abstract, Surrealism, Outsider Art, Impressionism, Expressionism -every style you can think of - and then some! Extremely collectable Pocket Art, you can't stop at just one! They can be displayed as artworks - hung in decorative frames either individually or in groups. It is signed and dated on the back.